Can someone help me with this? I'm looking for a complete and accurate list of all available paint codes with names for each year of the S12. I've looked at some PPG swatches and a few brochures I've seen online but do not know exactly what all was available and for what specific years for each territory. Here is a swatch I made as an example. I think this is based on 1986 (Silvia). Here are the PPG swatches I found for Datsun/Nissan. I'm guessing this is for North America mainly. In addition it is not specific to the S12 series unfortunately. You seem to have done a pretty good job. Lol. I wish I could contribute more, but this thread is pinn-worthy. Pin-worthy, yes. But why did you post this in the Garage, when there's a better place for it? (the Visual Mods and Audio section). I'll move and pin it there. Edit: On second thought... I may restructure the sections. I guess I was thinking paint and body. Didn't really think of mods. Nice work!!!! Ahhhh beloved #106 soon again! Code 210 is my fave. The color of my first Z31. Mine is 215 (Med. Pewter) over 210 (Lt. Pewter) from the factory, so I know that was an additional available color scheme for the S12 in the US. 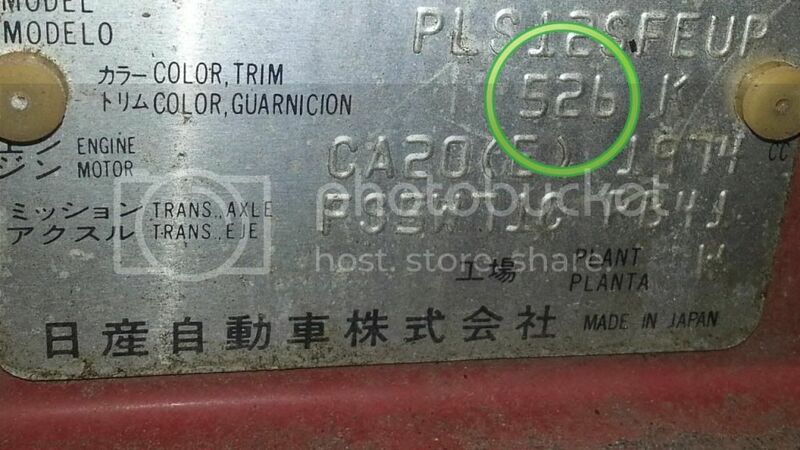 where can you locate the factory paint code?